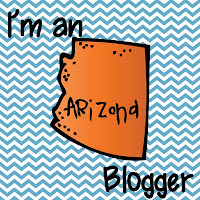 Teacher's Take-Out: I'm an Arizona Blogger! She has a great idea to join bloggers together from their own state! How cool! I joined the team of Arizona! It's so much fun to see where everyone is from and to find others in the same state as me! Click Here if you're interested in joining up. Thanks for stopping by my blog Stacy! I love the name and the look of your blog! Nice to meet a fellow Arizona teacher. Thank you for linking up and posting about it! I just linked up! I TOO am an AZ blogger (newbie)! !